Crafting Adventures: Sassy Anniversary Relay - Day Three! Sassy Anniversary Relay - Day Three! I'm not really a purple person but somehow got it in to my head that this card had to be purple! My image and my papers clash a little bit but on the whole, I'm pleased with how it turned out! 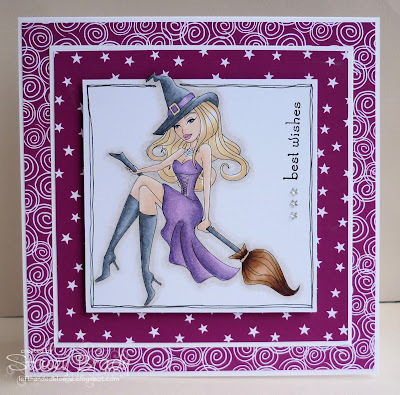 Stamps: Bewitched - Sassy Studio Designs. Copic Markers: E00, E11, E29, E31, E33, E35, E37, E50, E51, E53, Y21, V12, V15, V17, C1, C3, C5, C7, W1, W3, W5, W7 - available HERE from Dies to Die For. Tools & Embellishments: Whimsy Stamps sentiment and gems from stash. Make sure you pop back later, it's a Whimsy blog hop! She is lovely! Just the right colour! Oh she is fab and sassy and the colours are perfect. Perfect papers for her! Thanks for joining in the relay! Yey! I'm so glad you're back and enjoying your crafting again! All your Sassy cards have been gorgeous so far - well done in keeping up with the relay, I couldn't even get the first one finished in time! Ha ha! a lovely card, I don't think they clash at all. Sassy Anniversary Relay - Day 4!